We understand that in today’s DIY world, you’ll probably want to try shooting photographs of your books yourself instead of hiring a professional. If you have some time to spare, give it a try. In this world of quickly advancing technologies, cameras are getting better and better all the time. Trial and error are the watchwords. You may need to do a few experiments before you are happy with your images, but here are a few tips to get you started. The first step is to take a good photo in camera. To borrow a cliché, software can’t make a silk book out of a sow’s ear! Digital camera that can shoot at least 8 Megapixels with a suppress flash option, white balance adjustment. A large tabletop, or other flat surface. You can even use the floor. Experiment to see if your piece looks better flat, head on, or propped up. White or gray backdrop; may be cloth or paper. Make sure to iron out any wrinkles. Experiment depending on the size of your piece and structure of your piece. We do not recommend a black background. It is very difficult to shoot properly at home and many galleries frown on black backgrounds as the object always seems to be floating in space. A tripod is a good tool especially if you do not have a steady hand or are just starting out. Keep in mind, though, it will be harder to photograph from above with a tripod. Some work, especially larger flat pieces are better shot from above. Get as close in as you can. Sometimes because of the positioning constraints, you might have to use the telephoto option. Try photographing your work at several different angles. You may overlook subtle details that will become obvious at the computer. Having to set up and retake your photos several times gets old very quickly. You’ll be looking for shadows, wrinkles, background surprises, surface details not immediately noticed, angles not quite right, dust, dirt, etc. Photo editing software. Photoshop is the industry standard and if you can use it for editing, it might make things a lot easier. Photoshop Elements will work as well, and is designed more for the novice. Other software options may be able to achieve the same results. Save your original and edit a copy of your photograph. You may not like the changes you have made and want to go back to the original. Crop your photo to show as much of the piece as possible, leaving enough background to give your book some room to breathe. Avoid too much background as it is irrelevant to the work, and distracting. You may need to rotate your photograph to best accommodate your vertical or horizontal book shape. Make sure the book is straight in the image frame and that the perspective is correct. Fix any unusual angles or lens distortions. Explore the color correction features of your software program. You can try “Auto” correction options and see how it looks. If this doesn’t seem quite right, go through the steps to correct color cast, brightness, saturation, etc. until the image most closely resembles the actual book. Size images exactly as requested. How many inches should your image be? What should your resolution be? For images that will go to print, the resolution will need to be 300 ppi or dpi; for the web, 72. When keeping the size the same, but changing the resolution, uncheck “resample”. When changing the size, but want to keep the resolution the same, check “resample”. For a good article on how to resize or change image resolution, go to this link. Also, when editing for size and resolution, be sure to keep “restrain proportions” checked when offered as an option. Sharpen the photo. Almost all digital images benefit from some sharpening in your photo editing software. But, don’t try to sharpen an image that is out of focus. Reshoot that one. Always remember, for the best final product, it’s best to start off with the best quality image right out of the camera and make as few edits as possible. Too much editing will make your image look grainy or blurry. Even though Photoshop is magical, you are always one extra edit away from losing image quality. When naming your file, be sure to use some identifying information, like your last name. If you are submitting to a juried show the organizers will probably have a required naming convention. Be sure to use it. Here at 23 Sandy we always need your images to be named as, “yourlastname-1-a.jpg” etc. Follow the show requirements exactly, otherwise you images might get lost. Does the image meet the requirements for size and resolution? Is the image shot of a grey or white background? Are the colors you see on screen neutral? Are the whites white? Is the book object straight? Is the photograph in focus? Is the image noise under control? Now you’re off! Good luck and we hope to see a few great photos of your work sometime soon! Part I of this article, “What Makes a Good Photograph for Submission to a Juried Show or Gallery” can be found here. Part III of this article, “Hiring a Pro and Finding Community Resources” can be found here. 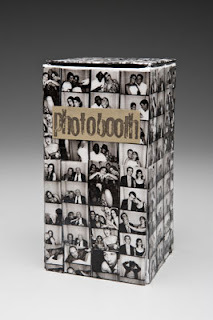 Image credit: Photobooth by Barbara Gilbert. Thanks for both articles – a great help.